I know I am rebelling against my youth, but I have never really been a fan of heavily sauced noodles. The sauce pretty much takes over and the noodles are more a back ground piece in many of the spaghetti style meals I have eaten most of my life. Maybe you enjoy that. But it isn’t really my thing (though we still do it from time to time). 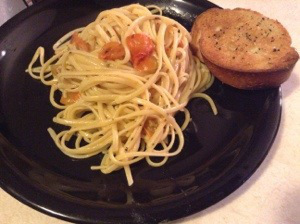 The great thing about this dish is you have some options available for how you sauce it and it really doesn’t take too much time to put it all together. You can do it without the cream or you can even go the route I did when I made this one and use soymilk instead of cream. If you take the soymilk route you could use vegan noodles and make the entire dish with no animal products at all. I didn’t go to that extreme though. In fact as crazy as this might sound I actually used commercial noodles. I do prefer home made noodles but sometimes time is a factor in what you have available. So let’s talk about how this gets put together. Cook and cool noodles. Then in big pot (again I use my wok for stuff like this) cook the onions and garlic on medium heat till soft. Add in tomatoes and allow to cook down. The sauce comes from the juice renderred from the tomatoes. You want to leave the tomatoes in their chopped form. 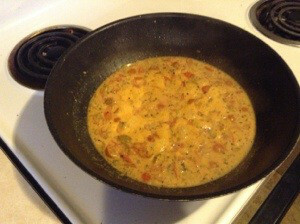 When the tomatoes have softened add in the cream and reduce. The sauce will be demi sec when it is ready. You want to have enough liquid to coat the noodles. Warm the noodles in the sauce they will absorb any excess liquid. 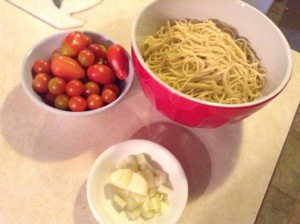 6 Responses to "Linguini with Tomato Cream Sauce"
Looks like a keeper…. only problem is finding great tasting tomatoes at this time of year! Canned tend to be the best for flavor this time of year. Unless you are a bit neurotic like me and you freeze a bunch from your garden for use during the winter. That sounds wonderful. Thanks for sharing.